Our newly remodeled hotel is conveniently located in the heart of the town and intersection on I-25 and I-70. Only few minutes from Downtown Denver; this Denver hotel offers Complimentary WIFI, Delicious HOT Buffet Breakfast, free parking, absolutely free 5 miles shuttle service is always ready to take you to Denver downtown, convention center, Merchandise Mart, Pepsi center, Coors Field, Sports authority at mile high, Six flag, Denver coliseum and many more famous attraction of Denver to make your stay more affordable. Hotel is only located few minutes away from Coors Fields home of Colorado Rockies, Sports Authority stadium home for broncos, Pepsi Center home for Denver Nuggets, Colorado Convention Center, Denver Coliseum, Merchandise Mart and great News is for you that hotel offers complimentary shuttle service to all these places. Clarion Hotel Denver also offers you Outdoor Heated Pool, 24 hours brand new fitness center, 24 hours business center facility, 24 hours freshly brewed special coffee, a game room, and ice machines on each floor and coin laundry with the great views of The Rocky Mountains & Denver Downtown. For business travelers, all our spacious rooms at the Clarion Hotel Denver have free cable TV and a work desk with lamp, coffee maker; provide you the best comfortable mattress with free WI-FI in your room. Guests will find an on-site business center at the Clarion Hotel Denver, as well as the Palm Grill Restaurant & Bar which is open 7 days with a pool table. Further, there is free Wi-Fi throughout the hotel. 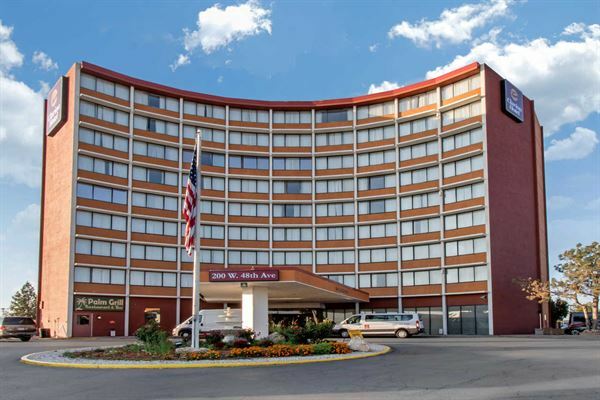 Hotel is located within few minutes of driving distance of famous 16th Street mall, Pepsi Center, Coors Field, Sports Authority at Mile High, Colorado convention center, Denver Coliseum, Merchandise mart and many more famous business and pleasure destinations. Whether you are here for fun or business we are the perfect host for you. Best way to host your any social or corporate event. Provide you ample amount of privicy with great open space.